Women's right to vote is leading the U.S. down the road to socialism. 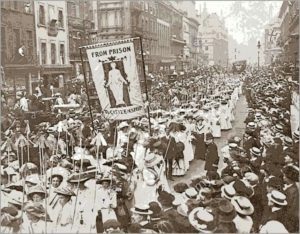 Will a woman's right to vote ultimately lead to socialism? Women are wired differently than men. Not better or worse, just different. Give a woman a choice and she will most likely choose safety and security over freedom every time. I believe women feel this way because subconsciously every woman knows that at some point she must endure a gestation period. During pregnancy, a woman’s physical abilities are impaired and for most of the 4.4 million years human-like beings have lived on earth, she would have been vulnerable to physical attack by other animals that wanted to eat her. I believe this subconscious feeling still exists today in modern women and drives them to nest, or otherwise prepare safe places to conceive and raise children. Also, in pre-historic times, women looked to a strong alpha male to protect them during this vulnerable time. This instinct worked well for “cavewomen,” but it doesn’t work so well when voting on modern public policy. I believe this explains why polls show women overwhelmingly support Barack Obama. In our modern society, “societal security” is more important than security from physical harm, women see Barack Obama as an alpha male in the best position to offer them the safety and security they secretly crave. Why else would otherwise rational women, vote for a man that has borrowed and spent more money than every other President in U.S. history combined? They must know it’s unsustainable, but they can’t help themselves. This is not a new phenomenon. Since 1920, the year the 19th amendment was rectified, the U.S. has been drifting toward socialism. Before 1920, those who would promise safety and security could only count on public workers, civil servants, socialists, and a small segment of liberally minded males for support. After 1920, with the addition of women to the electorate, the game changed forever. At first, wives followed their husband’s voting habits. But during WWII, as women entered the workforce and began to think “independently,” voting habits changed. The late forties, fifties, and sixties brought enormous social changes driven predominantly by this new liberal voting block. Socialist policies such as FDR’s “New Deal” and LBJ’s “Great Society” could never have happened before 1920 – before woman’s suffrage. Both parties have become extremely adept at pandering to this majority coalition of socialists, public workers, civil servants, unions, and woman. Today, safety and security sell with regard to the vote – not freedom and personal responsibility. Those politicians that scream security the loudest, get the vote, regardless of whether or not they have a workable, sustainable, plan. And the problem is getting very serious. Billion dollar yearly spending deficits are fast becoming the norm. This year’s Presidential election is nothing less than a referendum on social spending. The irony of this is not lost on Austrian economists. What the government gives, it takes twice – once to give back, and once for administration fees. Americans already work half the year to pay taxes and if they really had to pay the full cost of “government goodies,”(including the borrowed money), they would be working all year. Americans are already slaves and don’t know it. Where is the “societal security” in that? I don’t know what the answer is. Taking the vote away from women at this point is out of the question, but how will our free society survive? Will women evolve into modern creatures that eschew social spending and deny prehistoric emotion? I don’t see any hope of that on the horizon. The “tipping point” has been crossed. I’m afraid we’re heading for a dark age.